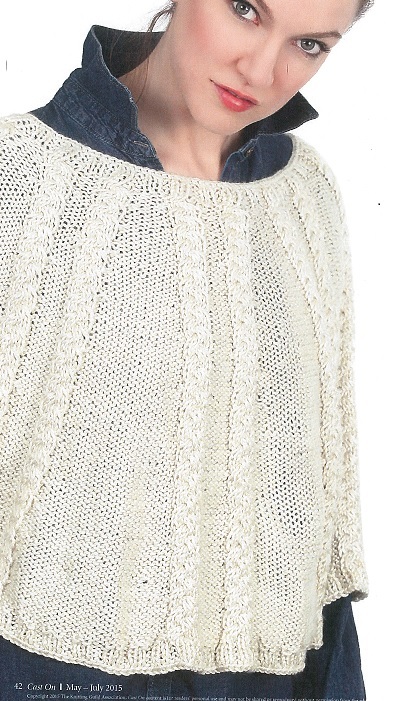 Alice Tang Knitting Blog: Cable Cape Published In Cast On May-July 2015. Cable Cape Published In Cast On May-July 2015. My latest design, top down, easy cables, increases between sets of 2 cables make the flare shape. The cable is an easy 6 stitch pattern. I actually subscribed toCast -On e-copy rather than paper this last renewal. My knitting bookshelves are full and hopefully my computer won't crash and the magazines won't go the way of my itune songs. This is knitted in the round from the neck down - in 2 sizes.